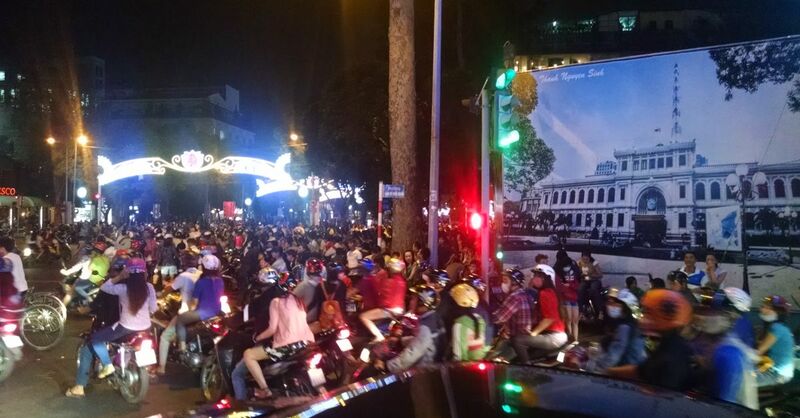 It was New Year's Eve, and a massive number of people and motorbikes were clogging the city's streets like nothing we'd seen before. 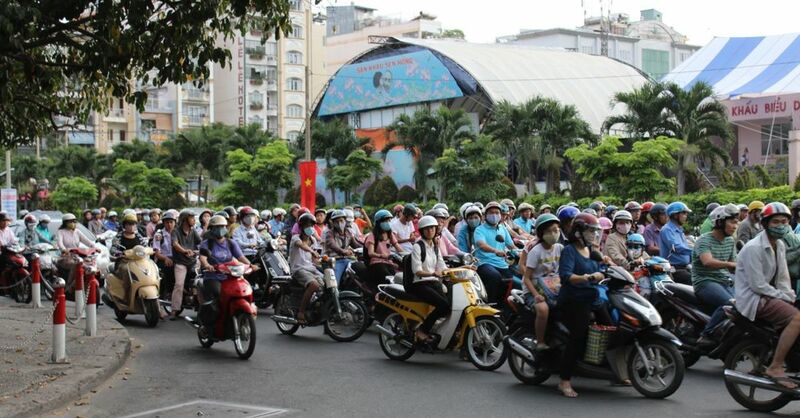 HCMC has a population of almost eight million people, and it felt like every one of them was either driving through the heart of District 1 on a motorbike or walking toward Công viên 23 Tháng 9 (Park September 23) to get a good view of the upcoming New Year's concert and fireworks show. Crowds have never really been my thing, so the idea of wading through all that was a little daunting, but that ice cream fondue platter was waiting for us, so we stepped into the fray. After about fifteen minutes of negotiating crowds and dodging motorbikes, we got to Ben Thanh Market, right across the street from the park where the concert was about to take place. The streets around the market were filled (and I do mean filled) with motorbikes parked side-by-side across the width of the roads. People were just lying on top of their bikes — which is a sight to see — waiting for the show and the fireworks to begin. We'd been warned repeatedly by people and by signs about pickpockets, so I was being very aware of my wallet. I could feel it in my pocket as I stepped over the tires of a pair of bikes that were parked almost on top of each other. But this spot wasn't an easy place for my daughter to get through. She had to wriggle her way between the bikes. After we were through, she looked distraught, so we stopped for a moment. I asked her if she was okay. She nodded, but I could tell she was not happy. I squeezed her hand then started walking again, and as soon as I took my next step, I realized my pocket was a little light. I felt for my wallet, but it was gone. Just like that. I stood there, looking around. The thief was surely still in the area (there was no way anyone could run through that crowd) and was most likely one of the people lounging on top of their parked motorbikes. It could have easily been any of at least a dozen people. Even more likely, it was the work of a team and my wallet had been handed off down the line and was nowhere near me. It was the first time in my life I'd been pick-pocketed, and, as annoyed as I was, I couldn't help but admire the artistry behind it. There wasn't anything to do but try to minimize the damage, so we went back to the hotel. Instead of enjoying the fireworks over Ho Cho Minh City, I was on the phone, cancelling credit cards and trying to get replacements sent to me in Vietnam. In the end, I lost a million dong, which sounds like a lot but it's only about $50 U.S., a credit card (that was replaced in four days), and debit card (that took three months to get replaced, which made traveling through the next few countries somewhat difficult). I also lost my driver's license. I still don't know why I was carrying that — I hadn't driven a car in three months. The greatest loss was the wallet itself, a cuben fiber number that is the best wallet I've ever owned. Fortunately, I'd picked up another one when I met my friend Jason in Hong Kong (he makes these wallets and other cool gear at his Picharpak Workshop), so I started 2015 with a new (but empty) wallet. All in all, it was an embarrassing and inconvenient experience, but it could have been a lot worse. So far, there have been no serious repercussions (although I'm still watching my credit closely), and I haven't had my life stolen like Jasmina Tesanovic, who had her handbag swiped in Turin, an act that "crippled her life for the next two months." That sort of damage would have definitely put a strain on the rest of our trip. 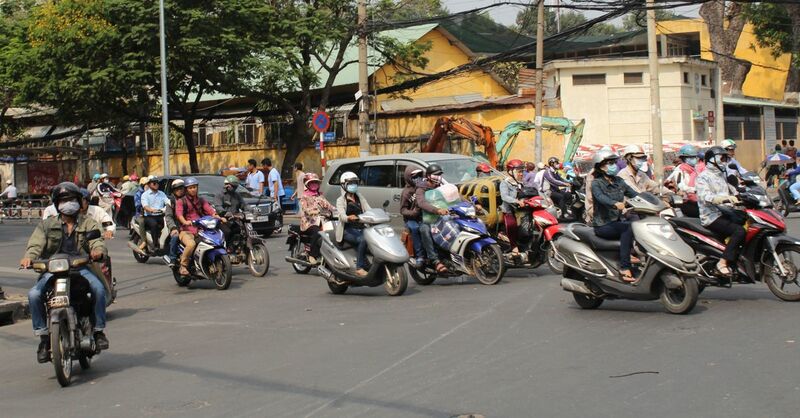 I read somewhere that crime rises in the time leading up to Tết, the Vietnamese New Year, when people need cash to buy gifts for their families and friends. I don't know how true that is, but as it so happens, Tết was only a month away. So I hope that someone had a nice Tết with my million dong. I want to say that I was able to overcome the experience and enjoy the rest of our stay in Vietnam, but I couldn't, not fully anyway. 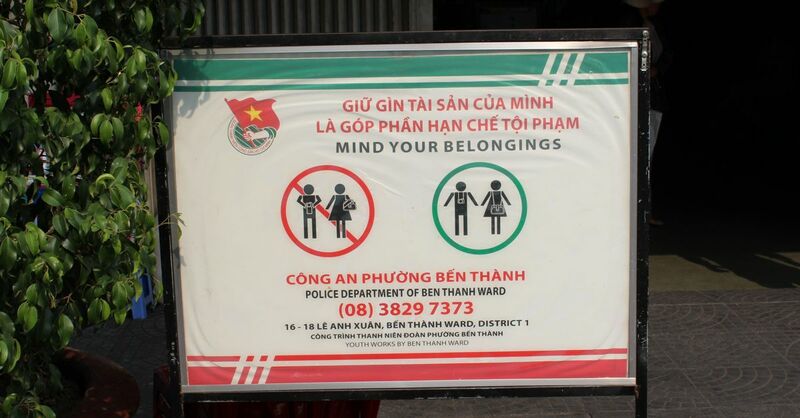 I really liked the time we spent in Hanoi, but Saigon left me with bitter memories. 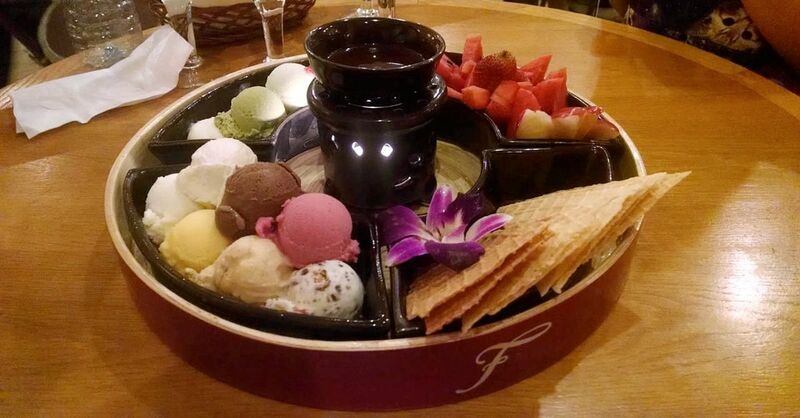 Except for that ice cream fondue platter, that is.